I thought I would take a minute or two to talk about how I teach gratitude to my children. We have an easy activity that we do to help the children reflect on what they have and how they can use their gifts and talents to serve others. The activity is super simple and can easily be modified for an early reader.. (or modified to be more difficult for older children). So, like many other activities here, I made a few Gratitude Worksheets for Kids to share with you. Then, have the children think about what they have and thank others for what they have. You can write a thank you note, or call someone. Have them imagine life without that thing..you could do an activity and remove that item from their life. Show them what it means to appreciate. Another way to teach appreciation is to do service. Go to a soup kitchen or help make blessing bags for someone and give out the blessing bags. Show them how fortunate they are for what they have. (And show them how they can help others with what they have). Point out small blessings. The smile of a friend, or point out when someone helped you. Help the children know what they are good at and how they can use those talents to serve others. Do they like to sing or play piano? See if they can perform at a nursing home. Do they like to play cards? They could play at a nursing home too! 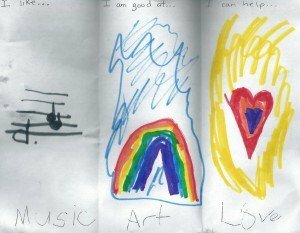 My second grader likes music, is good at art and can help by loving. I asked her what it meant to help by loving and she said that she could help cuddle her baby sister. She is right… helping to hold and cuddle her baby sister does help me quite a bit! It frees up my hands to help others. 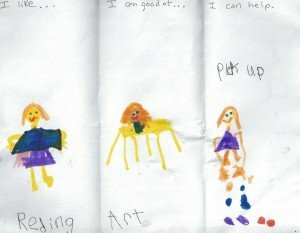 My kindergarten student likes to read, is good at art and she can help by picking up. She is right too! She is amazing at helping around the house. I was pleased by both of their drawings. They did a good job reflecting and what their talents are and how they can help others with the gifts that they have. What do you like to do? What are your talents and how can you serve others? Whether you are a beginning reader, or a fluent reader, it is good to reflect on these things and try to focus our attention on how to make the world a better place. Anyway, to get your free Gratitude Worksheets for kids, fill out the form below and they will be sent to you. If you have any trouble with downloading the Gratitude worksheets for kids, send me an email to [email protected] and let me know you are having trouble with the Gratitude worksheets for kids. (We have a lot of free worksheets so I need to know how to help you). 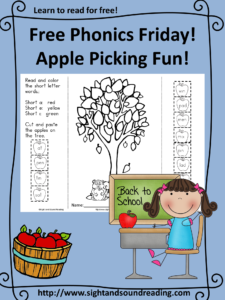 By filling out the form you will be added to our email list where you will find out about other fun things like more free worksheets. These are great! I so want my kiddos to have a grateful attitude, and yet I feel so inadequate to teach it. There are great steps to begin with. Thank you for sharing. Glad you enjoy! I find my kids really liked the activity and it helps them reflect on their blessings. What a great idea! We made thankfulness trees this year, and are putting a new leaf on every day in November. I love that! That is a great thing to do each month of the year…not just November! I think I will have to start a new tradition. Great ideas! Always a good idea to spread gratitude! Thank you! You are welcome..thanks for stopping by! Very cute ideas on teaching our kids to be thankful. Sometimes I get so wrapped up in the menu, the company, the business that I forget to be thankful or forget to remind my kids that we need to be thankful. So this is great! Thanks for linking up on Toddler Fun Friday! Love this! Featured it on this week’s #GoodFriendsFriday linky – live now! Such great ideas for teaching such a valuable concept! Thank you for sharing at Friday Frivolity!! Hi can i please have the give thanks worksheets? 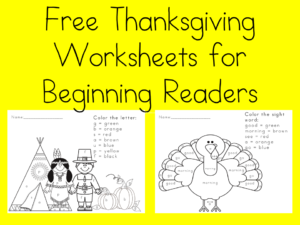 I would love to have the Give Thanks worksheets. They look awesome! Sorry you were having trouble getting the Gratitude Worksheets. To get them, you enter your name/email into the blue box. I will do that for you now. Please check your spam box…. To get the freebie you need to enter your name/email into the form and then it will be auto-mailed to you. I will do this for you now. If you don’t find the freebie, check your spam folder…sometimes things go there. The freebie has a subject of “Here is your free download!” …Inside that email there is a link. That link, if you click on it, the download will either popup in a new tab or download into your download folder. Sometimes that link does not come hyperlinked. If that happens you have to copy/paste the link into a new browser tab and it will then open for you. If you have trouble with this, though, you can forward me the email/replay to the freebie email you received and I will be happy to help you with it. In either case… if you can’t find the email I am talking about -let me know and I will get it to you.